, “no one can attain the goal without practicing,” CC 2.8.196) is attained simply by seeing Shrimati Radharani, even without performing any sādhanā. This is the special feature of Radharani that even Svayaṁ Bhagavān Shri Vrajendra-nandana (Krishna) does not have! Therefore it is no wonder that a single bath in Radha Kund causes the tree of prema to sprout in the field of one’s heart. To this the answer of the Mahājanas will be: Wherever the scriptures and the saints proclaim such miraculous and inconceivable results, it must be understood to refer to offenseless practitioners. Only an offenseless soul who bathes in Radha Kund will attain love of God, otherwise this would actually be visible in anyone who bathes there. Such offenseless persons are very rare and the fruits of such a benediction are not visible to our eyes so soon. Still, there is no reason to doubt these glorifications, for even an offensive person who bathes in Radha Kund can get rid of his offensive attitude and attain this supreme goal by patiently bathing in Radha Kund again and again. This is the realized conclusion of the scriptures and the great saints. Someone may also think: “The whole of Vraja-maṇḍala has the power to give love of God to its pilgrims, for the Padma Purāna states dinam ekaṁ nivāsena harau bhaktir prajāyate: Simply by staying in the Mathura district for one day one will attain devotion to Lord Hari. 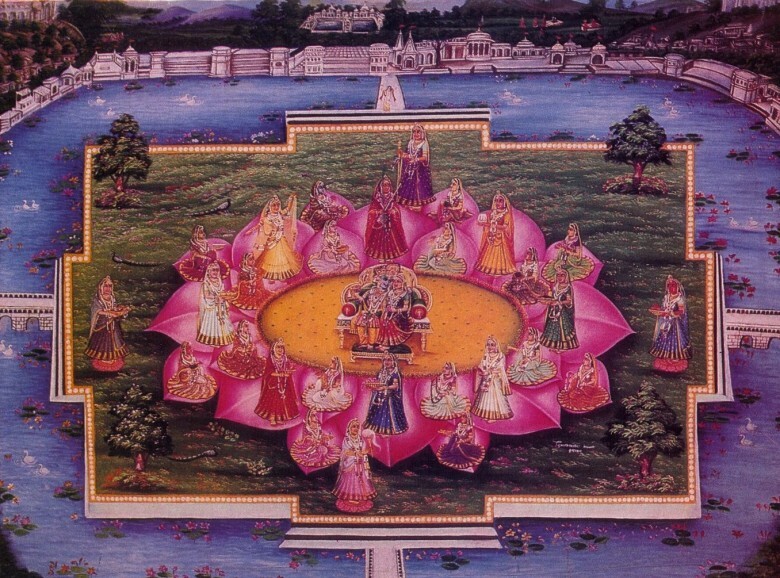 What then is so special about bathing in Radha Kund? The answer to this is: Love for Krishna is greater than love for any other form of God, because Krishna is the Original Personality of Godhead. The pure and intimate love of the rāgātmikā-vrajavāsīs is far greater than the reverential devotion to Lord Hari found in the inhabitants of Dwaraka and Mathura. On top of that, as the text says, the prema-kalpa-druma (desire tree of love) attained by bathing in Radha Kund is not only unattainable by aiśvarya devotees or by those who worship Krishna in the mood of a servant, friend, or parent, but it is even hard to attain by Krishna’s own madhura-bhāvamayī girlfriends. It is well known that the amorous mood is superior to the rasas of the fraternal and servitude moods. The crown jewel of all the madhura-rasa-nāyikās, the gopīs, is Vrishabhanu’s princess Shri Radharani. Her astonishing mādana-rasa gives the greatest and indeed complete relish to Krishna and she has mercifully infused this sweet rasa in her surrendered girlfriends and handmaidens too. Therefore in the kingdom of ecstatic love the relish of the sakhis and mañjarīs reigns supreme. Still, the maidservants taste even more rasa than the sakhis. It is their prema which is hard to attain even for Krishna’s beloveds (the sakhis and other nayikas), but which is sown in the heart of someone who faithfully and offenselessly bathes in Shri Radha Kund! The wish-yielding tree of love for Krishna swiftly grows in the heart of anyone who always bathes in Shri Radha Kund. Such is the prowess of the kuṇḍa! That dear most Radha Kund which is hard to attain even by the Vraja-gopīs, is my only shelter!